Babs Young has been off to Charlevoix again. She writes: Here is the drawbridge in Charlevoix as the ferry is leaving for Beaver Island. People never seem to tire of watching the boats go by and the bridge go up and down, almost every hour and on the half hour too. 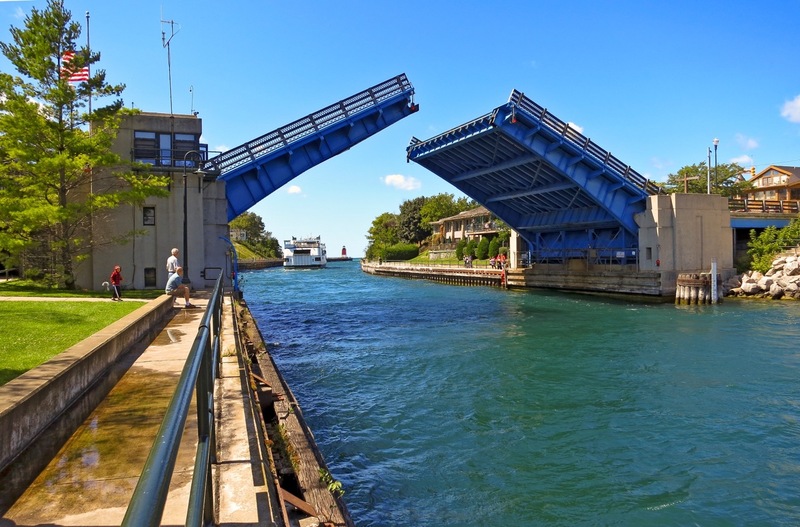 The bridge is very useful if your tallish boat is moored in Round Lake and you want to take it out into Lake Michigan. On the other hand, the bridge is often cursed by people wishing to move between, say, Eastport and Petoskey during the height of the summer. I have been known to make an intemperate remark myself. Living amidst all these lakes is lovely, but it can be inconvenient. Yes indeed it can. At least when this bridge is down it is possible to take it to get from somewhere pleasant to somewhere else pleasant, so that’s all right then. I like this photo. I like the color saturation (yeow) and the subject. You know I like boaty things, too. Thank you. Boaty things are one of our specialties. The history of bridges is interesting. Here, we have the Clear Creek Channel connecting Clear Lake and Galveston Bay. The town of Kemah’s on the South, Seabrook to the north. At first, there was a ferry. Then, there was a swing bridge. Eventually a drawbridge like this one was installed, but now we have a very impressive, very high four lane bridge going over it all like a bell curve. I think I’d advise you folks to stop right now. No need for that big concrete bridge. You can see all the way across the Bay from the top, so that’s an advantage. And there was that unicyclist who liked to ride across it naked, but I think they’ve put a stop to that. I like that your bridge is blue, too. It’s much more attractive than gray concrete. A four-lane bridge would pretty much take up all of downtown Charlevoix plus five or six miles on either end. No. Way. Naked unicyclists are welcome to ride across our little drawbridge. Even in August they would probably turn a little blue, though, just like the attractive bridge. Ah, the beautiful blue! Beautiful blue bridge, beautiful blue sky, beautiful blue-green water. Michigan is the BEST! Now remember, you are talking to someone who grew up in Rhinelander . . . but I surely do love Michigan. And Wisconsin. And Ontario. And New York. The whole Freshwater Nation. I like the smart blue paint. Keep the bridges coming. That bridge makes for a very enjoyable lunch in the Weathervane. My favorite viewing was when a sailboat motored up to the bridge and began blowing its horn. The bridge operator does not obey horns. When he finally raised the bridge, the sailor started under before the bridge was all the way up. The boats rigging got caught on the bridge and was partly ripped away. And the lunch was very good too. I, too, have enjoyed some memorable lunches at the Weathervane. It’s good to go to a place that offers first class entertainment – and to think that they don’t even have a cover charge! For those of you not from Around Here, the Weathervane is just beyond the bridge on the north (right) side of the channel. It has that characteristic wavy Earl Young mushroom house roof. That’s a really pretty bridge. Of all the times I’ve been to London, I’ve never seen Tower Bridge opening up other than on TV. I like the idea that this one does so regularly. Mercy. Persistent fellow, isn’t he! I think exhibitionists mostly like to let it all hang out where there are plenty of people to astonish. Around Here there are so few of us–and some of us so surly–that it just wouldn’t be much fun. Watching the bridge go up and down, now that’s fun. Particularly if a surly boater happens to get his rigging tangled in the wringer, so to speak. Mr Uhdd would just love to sit and watch that bridge! Mr. Uhdd would probably sail back and forth on the channel just for the pleasure of watching the bridge. But he would never get his rigging tangled, let alone honk at the bridge tender. Love bridges too…especially ones that move. Sorry we didn’t get to meet last weekend..but next time I’m up I’ll try to hang out on your side of the bay. Next time you’re up I’ll make sure the car and I are both operational at the same time! I know you had a great time over on the Leelanau, though. What’s not to love about Northport? That Babs is quite the photographer. She is that. We hope to keep her around. What a lovely blue drawbridge! Last time I was driving my mom through Charlevoix we almost got in a fender bender. Luckily we didn’t. Perhaps it was near this bridge. Charlevoix is small and the bridge central. Perhaps you were near it, fenders spared. Lookie here. This is from your neighborhood, and a good story on top of it all. I’ll note that there is some bridging of generations here, and geography, too – just to make it fit in ith your bridge post. I did go lookie there, and enjoyed myself very much. Looks like they have a cottage on Otsego Lake, which I have to tell you is one of my all time favorites for a lot of complicated reasons, and a family history on Torch. You have a gift for sussing out good stories. I was looking for something entirely other and came across this 1979 photo of our drawbridge Gone, but not forgotten, that’s for sure! Virtual travel is so broadening. Texas–like Michigan or Nebraska–is not just what we might think of right off the bat. Cool bridge. Gerry – The drawbridge in Charlevoix IS a four-lane bridge. The road (US-31/Bridge Street) is two lanes from just south of the bridge through downtown, to the hill by 7-11. If the powers that be wanted to reduce the bottleneck effect, they would have to eliminate downtown parking on Bridge Street. Then you could zip along on a 4-lane road al the way. (Admittedly, it would be kind of tight and potentially dangerous for pedestrians. This is embarrassing. I cross that bridge on a regular basis and have never thought of it as anything but two lanes (plus sidewalks). Next time I’m up there I’ll have to take special note. But the problem isn’t really how wide the bridge is – it’s how low it is. It’s the opening-up-and-letting-boats-through part that creates the worst bottlenecks. I don’t really mind it unless I’m trying to get to Petoskey on time for something, and then I mind it a lot. All the lakes and rivers are almighty inconvenient, but I’d rather have them than convenience, that’s for sure.